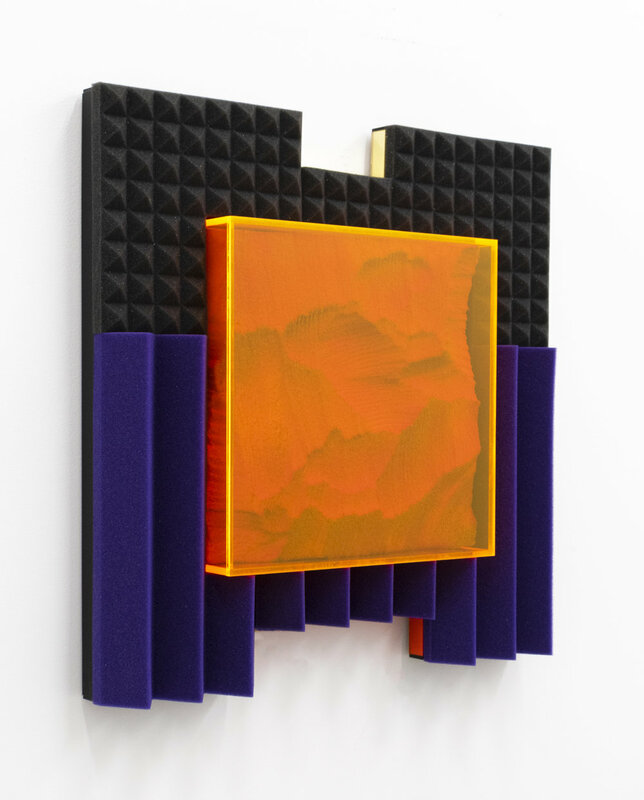 Tensor Field features seven new works that highlight Buchner’s continued investigation into the complex relationships between materials and experience and the prevalent use and symbolic possibilities of plastics. Utilizing both additive and subtractive processes, soft and rigid plastics, his current work references the shallow illusionism, backlit glow and overlapping layers of our digital field. Replacing the open browser windows, guides and grids of our shared digital lives with physical materials, Buchner reminds the viewer through frontality, reflection and scale, of our own bodies. His practice is rooted in a long fascination with Color Field painting, the Light and Space artists and the structures of Neo Geo. Buchner seeks to extend these historic visual and material languages by focusing on their relationship to contemporary technology, notably the flatness and vastness of the screens in our world, but also through their respective histories with plastic. Building on personal experience Zachary navigates a world of disruptive combinations: reflection and absorption, identity and its artificial construction. He mines a social landscape built on connectivity and isolation in an attempt to better define and understand the contingencies of contemporary experience and space. Zachary Buchner (Canadian, b. 1979) is an artist and educator living and working in Oak Park IL. Buchner received his MFA from Northwestern University in 2005 where he currently teaches Painting and Sculpture in the Art Theory and Practice Department. Zachary is the director of PRACTISE, an artist centered exhibition space, and is represented by Andrew Rafacz Gallery in Chicago IL.